There is also a non-functional role of humor that is significant in Zen, in that it is a way to express enlightenment, liberation, and inner harmony. One of the main functions of humor in Zen is in trying to allow one to understand the absurdity in attempting to classify reality into categories. Thus, the boundaries formed between logical issues are broken down, revealing the frustration that Zen has with logic and reasoning. 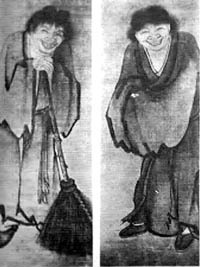 An example of this can be seen in a Zen anecdote about a Zen master who lay dying. His monks are all gathered around his deathbed, and the senior monk leans over and asks the master for any final words of wisdom for his monks. The old master weakly says, "Tell them Truth is like a river." The senior monk relays this message on to the other monks. The youngest monk in the group is confused, and asks, "What does he mean that Truth is like a river?" The senior monk relays this question to the master, and the master replies, "O.K., Truth is not like a river." We see here a serious message wrapped up in a humorous package. The absurdity of classifying things into little boxes is revealed here: Truth is and is not like a river; it transcends classification. We can see this same sort of frustration with reason in numerous kôans. Hakuin's "What is the sound of one hand clapping?" and Joshu's "Does a dog have Buddha-nature?" are all questions that cannot seriously be answered through logic; Zen humor reveals the absurdity in this. We can also see this absurdity in Zen art, with paintings of the Buddha as a naked little boy passing gas, or of a bullfrog sitting, as if performing zazen (Zen meditation), with a smirk on his face. The calligraphy on this sketch of the bullfrog by Sengai reads "If by sitting in mediation, one becomes Buddha...", leading the reader to associate this frog as being a Buddha in itself. Through this rather comic artwork, one sees the Buddhist doctrine of all animals having Buddha-nature. Humor delivers something that one does not expect -- the comic surprise, so to speak. Zen humor relies on this comic surprise not just to be funny, but also to allow the reader to experience certain truths. The humor helps break down dualities between the sacred and the profane, the beautiful and the ugly, the spiritual and the temporal. For example, one story tells of how a monk asks Ummon, "What is Buddha?" and Ummon answers, "Dried dung." Conrad Hyers remarked that in Zen, we see a "spiritual democratisation of things", meaning that all great things are humbled, and all 'lowly' things are elevated onto a level playing field. An emphasis in Zen is on the comic reversal, in which opposite terms are switched. For example, Sozan was once remarked to have said that the most prized thing in the world is a "dead cat" because "no one thinks of its value." In this comic reversal, the world has been turned upside down, collapsing all relativity. Thus, Zen humor helps one realize the futility and the uselessness in the classification and judgment of the world. Another function of Zen humor plays a similar role of the previously discussed function: it reveals how two things, thought to be opposite, are actually the same. The breaking down of boundaries thus reveals how one should not discriminate against, but move towards a doctrine of unification and nonduality. One Zen story tells us about Zenkai, the son of a samurai, who becomes the retainer of a high official. He falls in love with the official's wife, and his adultery is discovered. In self defense, Zenkai kills the official and runs away with the wife. They both become thieves, and eventually Zenkai becomes disgusted with the woman, and leaves her. Wanting to make up for his past, Zenkai decides to dig a tunnel through a mountain where many people die while trying to pass over it. After working for thirty years on this monumental tunnel, alone, the son of the slain official finds Zenkai and wants to kill him for revenge. Zenkai tells the son that he will give up his life, but only after the tunnel has been completed. So the son waits and waits for several months, as Zenkai continues digging. The son eventually grows bored of waiting and decides to help Zenkai dig, and he comes to admire Zenkai's perseverance and strong character. When the tunnel was finally completed, Zenkai offers his life to the son, but the son replies teary-eyed, "How can I cut off my own teacher's head?" Here we see two opposites becoming one: the enemy becomes the student. This sort of breaking of boundaries is a significant part of Zen humor. Although this story may not produce a laugh, there definitely are some comedic elements at work with such a grand reversal. Another story tells of a Chinese monk who wore a Buddhist robe, a Confucian hat, and Taoist sandals. This monk, by breaking out of religious stereotypes, reveals one of the main goals of Zen humor: to find a higher unity. Zen emphasizes the comic impulse, as opposed to the tragic, which aims to separate things out from each other, dividing the world into opposites. In Greek tragedies, protagonists and antagonists are pitted against each other, dueling for their own beliefs, unable to see the compromise of the beauty and rightness of the other side. The opposite of this is in Greek comedy, whereby two competing sides finally resolve their conflicts within some sort of absurd way (as in Aristophanes' Lysistrata, where two city states are fighting, but the war ends when the soldiers of both cities abandoning the war to unite with their loved ones in bed). The Zen vision of life, when compared between the tragic and the comic, can be seen as being comic (at least by a Western standpoint!). We see in Zen a harmony of the opposites, a unification of the yin and yang. A significant nonfunctional aspect of Zen humor is that after it has collapsed categories and united opposites, it helps release tension. Thus, it can be seen as an expression of liberation, and is analogous to enlightenment. Just like how one suddenly gets a joke, even if it is days later, in the Rinzai school, the attainment of enlightenment is sudden. (Note: In Dôgen's Sôtô school, enlightenment is much more of a gradual process through zazen, and so much of what will be discussed in this section is not applicable to Sôtô Zen. However, in Sôtô Zen, there are sometimes certain events that can lead one closer to the final goal of enlightenment.). One story tells of a Chinese monk named Shui-lao, whose master kicks him in the chest, resulting in enlightenment (satori). The monk then says, "Ever since the master kicked me in the chest I have been unable to stop laughing." In his enlightenment, Shui-lao expresses his feelings of freedom through laughter. Through laughter, Shui-lao is free, allowing his emotions and spontaneity let loose. In this sense, the original problem discussed about Buddha's laughter can be attributed to his higher understanding and liberation of the spirit - he is thus physically demonstrating his enlightenment. Thus, although Bharata's schema of laughter has been inverted in Zen, laughter has been elevated to have a new important meaning and is no longer seen as vulgar. Another story tells of how one of Buddha's disciples reveals his enlightenment through a 'wordless smile.' This smile was passed along until the Bodhidharma brought it to China, where the smile was transformed into thundering laughter. In the real world, we see how one can spontaneously trigger laughter, and this reflects the Zen tradition of how the realization of enlightenment is also spontaneous. Conrad Hyers, in his Zen and the Comic Spirit, writes that there is "often a kind of comic midwidfery in the Socratic sense of a technique for precipiating (or provoking) an inner realization of the truth." Humor, as shown before, is a vehicle for understanding the world, and helps one reach enlightenment and remove one's attachment from the world. Thus, in Zen art, we have proof of all of this with masters and monks drawn with big bellies and gaping mouths, bursting with laughter.